I almost feel guilty when I criticize the garbled economic thoughts of Pope Francis. After all, he was influenced by Peronist ideology as a youngster, so he was probably a lost cause from the beginning. Moreover, Walter Williams and Thomas Sowell have already dissected his irrational ramblings on economics and explained that free markets are better for the poor. Especially when compared to government dependency. But since Pope Francis just attacked tax havens, and I consider myself the world’s foremost defender of these low-tax jurisdictions, I can’t resist adding my two cents. Here’s what the Wall Street Journal just reported about the Pope’s ideological opposition to market-friendly tax systems. The Vatican denounced the use of offshore tax havens… The document, which was released jointly by the Vatican’s offices for Catholic doctrine and social justice, echoed past warnings by Pope Francis over the dangers of unbridled capitalism. …The teaching document, which was personally approved by the pope, suggested that greater regulation of the world’s financial markets was necessary to contain “predatory and speculative” practices and economic inequality. He even embraced global regulation, not understanding that this increases systemic risk. And he said that governments should have more money to spend. A section of the document was dedicated to criticizing offshore tax havens, which it said contribute to the “creation of economic systems founded on inequality,” by depriving nations of legitimate revenue. Wow, it’s like the Pope is applying for a job at the IMF or OECD. Or even with the scam charity Oxfam. In any event, he’s definitely wrong on how to generate more prosperity. Maybe he should watch this video. Or see what Nobel Prize winners have to say. P.S. And if the all that doesn’t work, methinks Pope Francis should have a conversation with Libertarian Jesus. He could start here, here, and here. Two days ago, I contrasted the views of Pope Francis and Walter Williams about capitalism and morality. I explained that Walter had the upper hand because free markets are a positive-sum game based on voluntary exchange while redistribution (at best) is a zero-sum game based on coercion. That’s the theoretical argument. Now let’s look at the empirical data, specifically focusing on which approach is best for the less fortunate. Thomas Sowell, the great economist at Stanford University’s Hoover Institution, is not impressed by the Pope’s analysis. Here some of what Prof. Sowell wrote for Investor’s Business Daily. Pope Francis has created political controversy…by blaming capitalism for many of the problems of the poor. …putting aside religious or philosophical questions, we have more than two centuries of historical evidence… Any serious look at the history of human beings over the millennia shows that the species began in poverty. It is not poverty, but prosperity, that needs explaining. …which has a better track record of helping the less fortunate — fighting for a bigger slice of the economic pie, or producing a bigger pie? …the official poverty level in the U.S. is the upper middle class in Mexico. 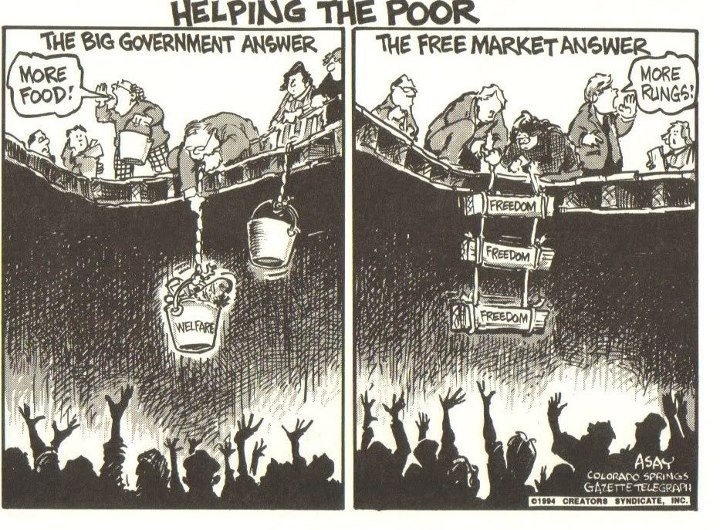 The much criticized market economy of the U.S. has done far more for the poor than the ideology of the left. Pope Francis’ own native Argentina was once among the leading economies of the world, before it was ruined by the kind of ideological notions he is now promoting around the world. I briefly discussed the failure of the Peronist Argentinian model last month, but let’s take a closer look at Professor Sowell’s assertions about the U.S. and Argentina. 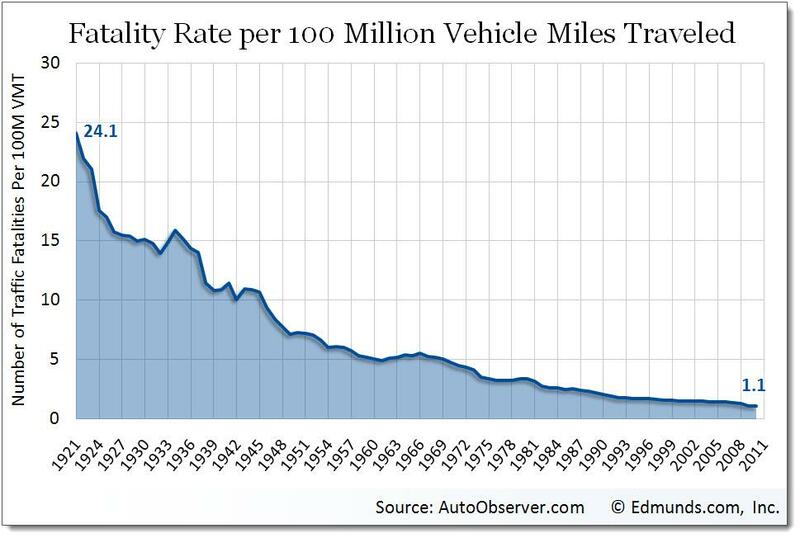 My colleague at the Cato Institute, Marian Tupy, has put together a great fact-filled website called Human Progress, and it allows users to access all sorts of databases to produce their own charts and tables. 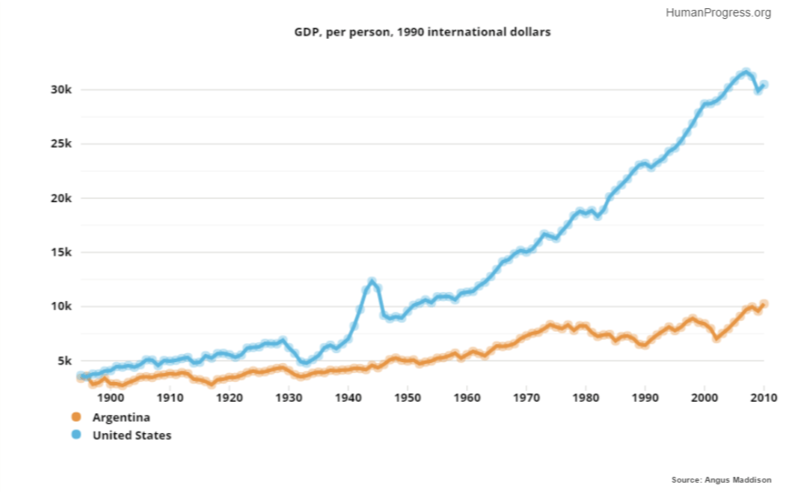 And here’s what the data shows about per-capita economic output in Argentina and the United States. Not exactly a ringing endorsement of the supposedly more compassionate system in Argentina. 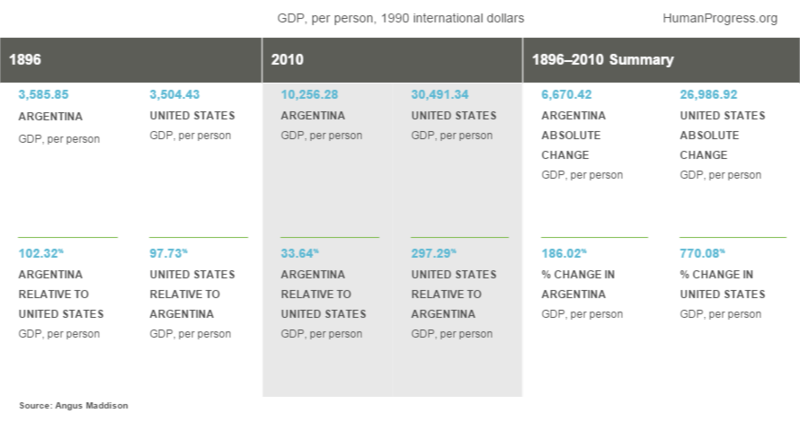 As you can see from this table, Argentina actually was slightly richer than the U.S. back in 1896. But that nation’s shift to statism, particularly after World War II, hindered Argentina’s growth rates. 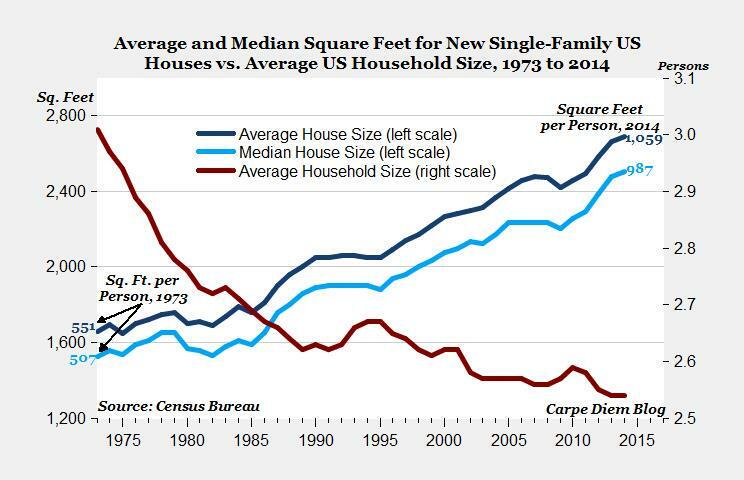 And seemingly modest differences in growth, compounded over decades, have a huge impact on living standards for ordinary people (i.e., inflation-adjusted GDP per person climbing nearly $27,000 in the U.S. vs an increase of less than $6,700 in Argentina). By the way, this is not an endorsement of America’s economic policy. We have far too much statism in the United States. But compared to Argentina, which generally has ranked in the bottom quartile for economic freedom, the United States has a more market-friendly track record. To help make the bigger point about the importance of economic liberty, let’s now compare the United States with a jurisdiction that consistently has been ranked as the world’s freest economy. 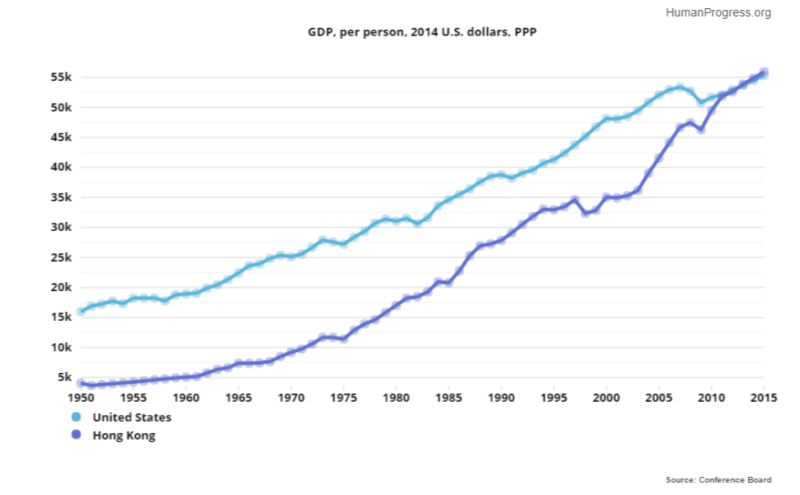 Look at changes in economic output in America and Hong Kong from 1950 to the present. As you can see, Hong Kong started the period as a very poor jurisdiction, with per-capita output only about one-fourth of American levels. But thanks to better policy, which led to faster growth compounding over several decades, Hong Kong has now caught up to the United States. 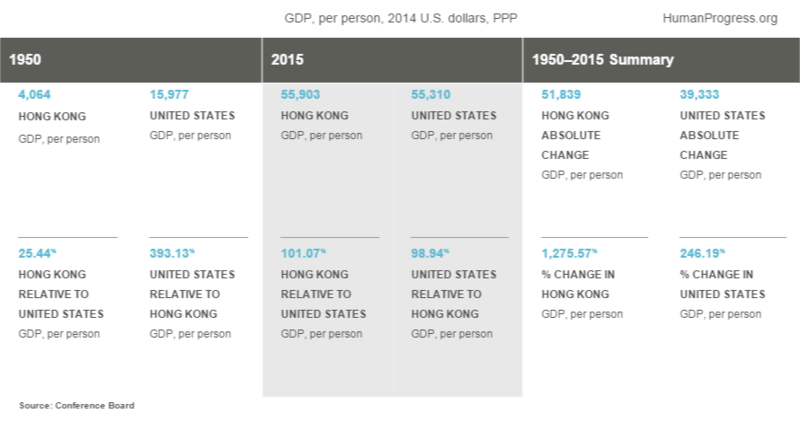 What’s most remarkable, if you look at the table, is that per-capita output over the past 65 years has soared by more than 1,275 percent in Hong Kong. Needless to say, if the U.S. is out-performing Argentina and Hong Kong is out-performing the U.S., then a comparison of Hong Kong and Argentina would yield ever starker results. I actually did something like that back in 2011 and the results further underscore that there’s a very powerful relationship between economic policy and economic performance. Which brings us back to the fundamental issue of what system is best for the less fortunate in society? I suppose that’s a judgement call, but poor people obviously have higher incomes and more opportunity when there’s strong economic growth. But as Margaret Thatcher famously explained, some people are so consumed by disdain for success that they’re willing to accept more suffering for poor people if they can simultaneously lower the incomes of rich people. What’s the greatest economic tragedy in modern history? The obvious answer is communism, which produced tens of millions of needless deaths and untold misery for ordinary people. 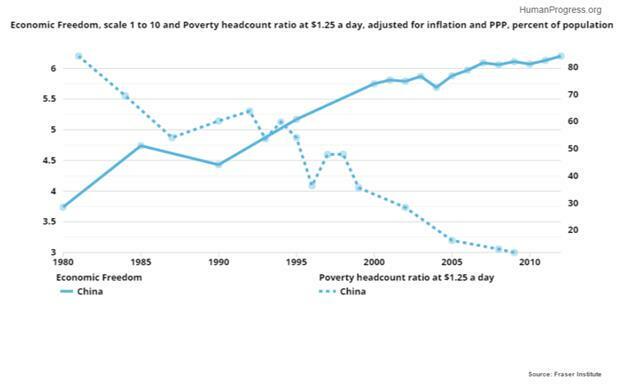 Just compare living standards in North Korea and South Korea, or Chile and Cuba. But if there was a second-place prize for the world’s biggest economic failure, Argentina would be a strong contender. Here’s one fact that tells you everything you need to know. In 1946, when Juan Perón came to power, Argentina was one of the 10-richest nations in the world. Economic policy certainly wasn’t perfect, but government wasn’t overly large are markets generally were allowed to function. Combined with an abundance of natural resources, that enabled considerable prosperity. But Perón decided to conduct an experiment in statism. Here’s how Wikipedia describes his economic policy. Campaigning among workers with promises of land, higher wages, and social security, he won a decisive victory in the 1946 presidential elections. Under Perón, the number of unionized workers expanded as he helped to establish the powerful General Confederation of Labor. Perón turned Argentina into a corporatist country in which powerful organized interest groups negotiated for positions and resources. …The state’s role in the economy increased, reflected in the increase in state-owned property, interventionism (including control of rents and prices) and higher levels of public inversion, mainly financed by the inflationary tax. The expansive macroeconomic policy, which aimed at the redistribution of wealth and the increase of spending to finance populist policies, led to inflation. …Perón erected a system of almost complete protection against imports, largely cutting off Argentina from the international market. In 1947, he announced his first Five-Year Plan based on growth of nationalized industries. So were these policies successful? Not exactly. In an article published last year, The Economist wrote about Argentina’s sad decline. …its standing as one of the world’s most vibrant economies is a distant memory… Its income per head is now 43% of those same 16 rich economies… After the second world war, when the rich world began its slow return to free trade with the negotiation of the General Agreement on Tariffs and Trade in 1947, Argentina had become a more closed economy—and it kept moving in that direction under Perón. An institution to control foreign trade was created in 1946; an existing policy of import substitution deepened; the share of trade as a percentage of GDP continued to fall. …As the urban, working-class population swelled, so did the constituency susceptible to Perón’s promise to support industry and strengthen workers’ rights. There have been periods of liberalisation since, but interventionism retains its allure. The bottom line is that Perón was a disaster for his nation. Not only did he sabotage Argentina’s economy, he also apparently undermined the social capital of the country by somehow convincing a big chunk of the population that “Peronism” is an alluring economic philosophy. Sadly, Pope Francis appears to be one of those people. The Economist recently called Francis “the Peronist Pope,” referring to his known sympathies for Argentina’s three-time president, Juan Perón. In the 1940s and ’50s, the populist general upended Argentina’s class structure by championing the country’s downtrodden. …“Neither Marxists nor Capitalists. Peronists!” was the chant of Perón’s supporters. And it was borrowing from the church’s political thinking that enabled Perón to found his “Third Way.” …It comes naturally, then, to Francis, who became a priest in Argentina’s politically engaged church hierarchy, to adopt a populist political tone… He speaks directly to the region’s poor with a fire found in the “liberation theology” that inspired South America’s leftist revolutionaries of the 1970s. …“If you were to read one of the sermons of the first fathers of the church, from the second or third centuries, about how you should treat the poor, you’d say it was Maoist or Trotskyist,” he said in 2010, when he was archbishop of Buenos Aires. Pope Francis’ infatuation with statism is very unfortunate for a couple of reasons. The obvious reason is that he is in a position of influence and he’s using that power to promote policies that will reduce prosperity. And poor people will be the biggest victims, as I explained in this BBC interview. But there’s another problem with the Pope’s approach. Being charitable to the poor is supposed to be an act of free will, not the result of government coercion. Yet by making statements that – at the very least – are interpreted as supportive of a bigger welfare state, he’s taking free will out of the equation. “Libertarian Jesus” would not approve.